Vodacom Tanzania has launched a LTE trial in Dar Es Salaam, using Nokia Siemens Networks equipment. Nokia Siemens Networks provided its Single RAN platform based on the Flexi Multiradio Base Station, as well as its Evolved Packet Core platform, including the Flexi network server and network gateway and Liquid Core-based serving GPRS support node. In addition to providing its Mobile Softswitching that manages traditional voice calls, Nokia Siemens Networks provided its CSFB voice call system. HKT (SEHK: 6823) – HONG KONG, January 17, 2013 - PCCW mobile breaks new ground again and announces today to augment its 4G LTE mobile network base stations in MTR with 1000Mbps# optical fibers, enabling commuters to enjoy ultra-fast 4G services along major MTR lines. Starting from January 22, PCCW mobile's 4G LTE network coverage will be expanded to major MTR lines, including the Kwun Tong, Tsuen Wan, Island, Tung Chung, Tseung Kwan O, Disneyland Resort lines, and the Airport Express Line. In addition, PCCW mobile will continue its discussions with MTR about further coverage expansion to the remaining MTR lines, including East Rail Line, West Rail Line and Ma On Shan Line. PCCW mobile has augmented its 4G LTE mobile network by connecting the MTR base stations with high-speed 1000Mbps# optical fibers, so that more MTR passengers can enjoy faster 4G services with the larger bandwidth. In addition, HKT is the only mobile operator in Hong Kong offering Wi-Fi hotspots at many key locations throughout the MTR^. Customers can enjoy unlimited Wi-Fi in MTR and other locations when they subscribe specific local mobile data term plans. Also, customers can enjoy the hottest 4G smartphones offers in town when they subscribe PCCW mobile's "Ultimate Mobility Handset Plan"*. For service details, please call PCCW mobile hotline at +852 2888 0008, or visit any PCCW-HKT shop or www.pccwmobile.com. *1000Mbps is the network specification for the fiber backbone and is different from the actual speed experienced by the end users. ^Exclusive coverage applies to designated MTR stations. *For service details and T&Cs of "Mobile Security Service" package, please visit www.pccwmobile.com. PCCW mobile is an operating division of HKT, Hong Kong's premier telecommunications service provider which is majority-owned by PCCW Limited. As well as providing high-quality voice and data communications, PCCW mobile serves a broad spectrum of customers by offering media content and interactive services as one of the PCCW Group's unique quadruple-play platforms. This enables subscribers to tailor their own lifestyles with a rich mix of innovative mobile services, such as real-time TV, streamed digital music, shared viewing of photos and video clips, remote monitoring, ticketing, instant messaging, email solutions and an integrated fixed/mobile office communications solution. To learn more about PCCW mobile, please visit www.pccwmobile.com. Hrvatski Telekom has started with the implementation of its LTE technology based 4G network on 800 MHz frequency, i.e. in the frequency spectrum known as the digital dividend. With this investment, i.e. the provision of the advanced 4G network in this spectrum, HT has enabled its customers in rural and poorly populated areas to have the same quality of surfing and multiply higher data transmission speeds, commensurable to those already offered in big cities. The first locations have been put into operations in the broader area of Ozalj, Koprivnica, Drenovac, Petrinja, Otočac, and Josipdol, whose citizens now have access to the most advanced and the fastest mobile 4G Internet. As a leading provider in the domestic market, Hrvatski Telekom also has a leading position when it comes to the application of advanced technologies. Thus, HT is the first provider in Croatia and among the first ones in the region and Europe which has put into operation a 4G network based on the advanced LTE technology and the first one to offer to its customers data transmission rates ten times higher than the previous ones in rural areas. Taking into account the growth in the use of mobile Internet and increasingly demanding customers’ needs for higher data transmission rates, the new technologies such as LTE are a prerequisite for future networking and, accordingly, for economic progress. For that reason, the availability of fast Internet is a strategic direction of Hrvatski Telekom, which on a daily basis increases the availability of 3G and 4G networks and offers the largest availability of both networks in Croatia. To remind you, HT customers can use the latest generation network through tariffs Extreme Mobile net L and Extreme Mobile net XL, enabling rates of up to 75 Mbps for download and up to 25 Mbps for upload. For pleasant surfing at such speeds, HT has included in its offer a 4G tablet – Samsung Galaxy Tab 8.9 LTE. HOD HASHARON, Israel, January 8, 2013, via LTE-depot — Altair Semiconductor (www.altair-semi.com), the world’s leading developer of ultra-low power, small footprint and high performance 4G LTE chipsets, today announced that its FourGee-3100/6202 chipset has been selected by NETGEAR to power its line of LTE routers. The first product that is being developed under the combined efforts of NETGEAR and Altair is the Mobile Broadband Router (MBR1518), a TD-LTE router designed for home and small-office use that boasts a high performance Wireless LAN, USB attached storage and ruggedized firewall. Given the enhanced spectral efficiencies, available spectrum, and volume synergies with LTE-FDD; public fixed wireless and mobile operators are migrating from WiMAX to TD-LTE, resulting in rapid growth of TD-LTE networks.The MBR1518 TD-LTE router addresses this emerging market. Simultaneous growth in TD- and FDD-LTE also demands products that enable operators to seamlessly migrate from one technology to another. NETGEAR and Altair are focused on delivering such products. “By teaming up with Altair to develop high speed mobile routers, we will be delivering, to our service provider customers, highly integrated, feature-rich single mode LTE and Voice over LTE products,” said Michael Clegg, Senior Vice President and General Manager, Service Provider Business at NETGEAR. Trials of the MBR1518 are currently underway and service providers can expect a broad product roll-out in 2013. Sagemcom announces a new home Gateway with embedded LTE Modem at CES2013. 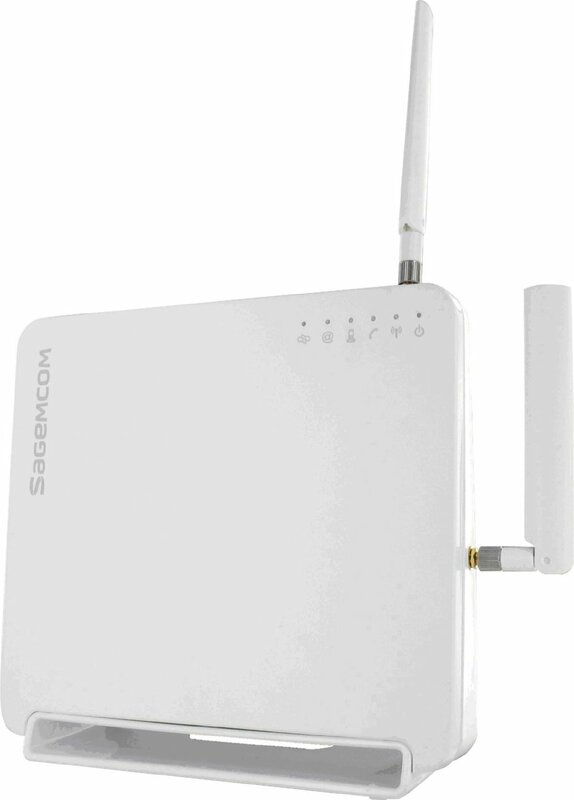 After many deployments based on 2G and 3G technologies, Sagemcom announces its new mobile generation LTE Home Gateway. This new generation of products enables the operators to offer triple-play residential broadband services (Data, Voice and TV) via their mobile LTE network. Based on Sagemcom know-how and expertise in the broadband terminals, the F@st 3965 Air is a high-added value home gateway offering all residential broadband services. The great variety of interfaces, such as Wi-Fi 802.11n dual band 2,4&5 GHz, USB ports, or the gigabit Ethernet routing allow to connect all the home network devices. Thanks to its proven software, the F@st 3965 Air is managed remotely, via TR069, or locally via a web interface. Support of DLNA and ability to store in the Cloud turn this device into a central multimedia server within the home. "The speed and coverage performance of LTE allows operators to offer residential services comparable to those offered on fixed lines. Sagemcom solutions provide the best of these two worlds", says Ahmed Selmani, Deputy CEO of Sagemcom Broadband. The F@st 3965 Air offers speeds up to 100 Mbps in LTE, or 42 Mbps in 3G, if the LTE network is not enabled. Two variants are available to cover all frequency bands and meet the needs of operators around the world. Under the deal announced today, RIM will be able to use InterDigital's patents in its upcoming line of BlackBerry 10 products, which are set to debut later this month. The deal comes just a few weeks after RIM settled a patent dispute with Nokia. In that case, RIM agreed to a one-time payment to Nokia and ongoing royalties for the use of its technology.